You could be forgiven for thinking that there has only ever been one Methodist Church in Horbury, although most people know it has been demolished and rebuilt in recent years. Well, you might be surprised to learn that there have been four different strands of Methodism and nine different church buildings. This is not an attempt to explain the Methodist movement as a whole but merely detail the various chapels that were built. Let's go back to 1744, 50 years before John Carr finished rebuilding the parish church of St Peter & St Leonard. It would seem that a group of young men, reading a religious book together in their spare time, were being moved by the same spirit that had moved John Wesley some 6 years previously. This group included a man named Edward Hanson, whose mother's house in Cluntergate became the first meeting house for Methodist worship in the town. Two years later, in 1746, the Methodists had formed a distinct Society, still meeting at Mrs Hanson's house. In 1751, John Wesley himself made his first visit to Horbury, although it is not known whether he preached at Mrs Hanson's or in the open air. Mrs Lydia Hanson died in 1762 and in 1765 a plot of land known as Hall Croft was purchased in Cluntergate. 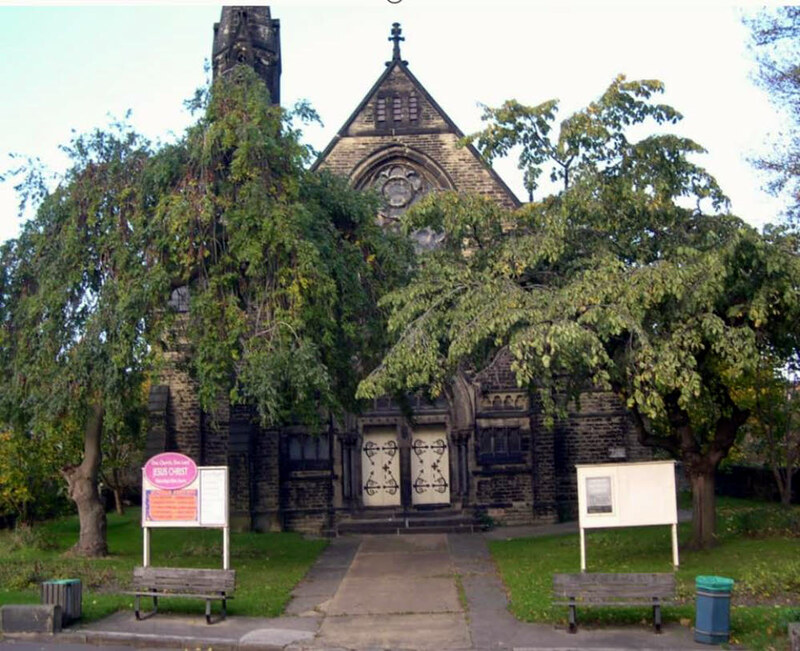 In 1899, a Methodist minister, Rev Joshua Haigh, of Ossett, described it as a 2 storey brick building seating 400. It was whitewashed and lit with candles. This was the first purpose built Methodist chapel. On the 7th August 1766, John Wesley visited Horbury again, possibly for the official opening of the chapel. He recorded the visit in his journal. Due to a growing cooperation between the established church & the new Methodist movement, it was agreed to form a society of masters for 'instructing poor children in reading, writing & the rudiments of Christianity'. It was agreed that the scholars would attend worship alternately in the church and in the Methodist meeting house. This society became known as the old Union Sunday School. The Methodist New Connexion broke from the original Methodist body in 1797. By 1819 it had established itself in Horbury and by 1824 had built a chapel at the top of Northgate; Horbury's second non conformist chapel. It is said that a mortgage of £300 had to be raised to build the chapel and the the New Connexion Society was unable to keep up the repayments. In 1839, the chapel was sold to the Congregationalists. In 1878, the building was sold to John Fallas, a furniture dealer, when the Congregationalists had built a bigger chapel at Westfield Road. By 1886, John Fallas had let part of the building to the Free Gospel Christian Bretheren. The chapel became Mount Zion, or 'Battye's Chapel', as it was known locally, after local shopkeeper Amos Battye and his family who became the leaders. Above: The New Connexion Methodist Chapel or Battye's Chapel, Northgate, Horbury now converted into a private house. Photograph by Helen Bickerdike. In 1820, another brand of Methodism arrived in Horbury. In a private house, across from St. Peter's Church, their enthusiastic preaching gave rise to the name 'Ranters'. To this day the place where the house stood is known as Ranter's Fold. By 1837, the Primitive Methodists were looking to build their first chapel. Two adjacent plots of land came up for sale east of Stringer's Yard, on what is now the High Street. The smaller of the plots was acquired by the Primitives and the larger by the Wesleyans, to build their second chapel. In 1851 the Primitives extended their chapel, purchasing land from Matthew White. In 1859, the foundation stone was laid for a Sunday School behind the chapel. Less than 50 years later, the Primitives built a bigger Sunday School, the foundation stone being laid on 23rd June 1906. (This building is still standing and now forms part of the new Methodist Church). The Primitive Chapel was eventually deemed too small and was demolished then replaced by the 'Ebenezer' Chapel, the foundation stone being laid on the 24th July 1875. This was eventually demolished in 1965 and the site redeveloped, currently the 'Lucky Flower' Chinese Takeaway and 'Bistro 42' occupy the site. 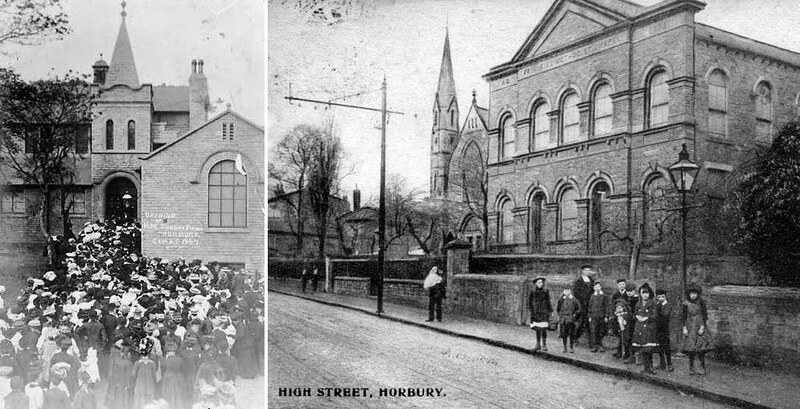 Above Left: Primitive Methodist Sunday School opening in 1907, which now forms part of the new Horbury Methodist Church. Right: Primitive Methodist Church, Horbury, now the site of the 'Lucky Flower' Chinese Takeaway and 'Bistro 42' . Pictures courtesy of the Neville Ashby Collection. In 1841, the second High Street plot was purchased by the Wesleyan trustees and on the 24th February 1845, John Turton laid the foundation stone. The church was completed early the following year and was by all accounts a rather impressive building. The panelled wooden door was flanked by two octagonal towers with battlements on the top. The church lasted only 37 years before demolition due to structural problems. Part of one of the towers was reconstructed at 'High Fields', the home of George Green, one of the trustees. On 6th October 1883, the foundation stones of the second chapel to occupy the site were laid. This chapel became known as St Paul's and was officially opened on the 23rd September 1884. Although it lasted much longer than its predecessor, it too would be demolished, due to structural problems with the tower, in 2012. Above: St Paul's Methodist Church before demolition. Photograph by Alan Taylor. In 1853, a young Society began meeting for worship in a house in Paradise Row, Cluntergate. Within a short space of time the Society was constructing a chapel on Queen Street. It was originally a small rectangular building, set back from the street. The gable end plaque showed the date 1857. At a later date the chapel was extended to the rear and to the front. It is nor clear though whether the front extension took place whilst the building was being used as a chapel, or later when being used as a shop. The building was sold and converted in 1900 for £380. The front of the building, facing onto Queen Street, is now 'Told Vape'. The rear of the building is the ruin of the old chapel. 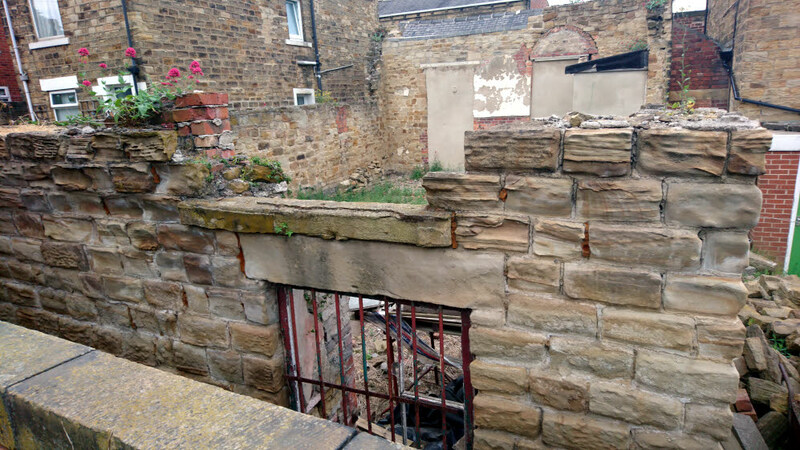 Above: Ruin of the old Methodist Free Church, behind 'Told Vape' on Queen Street, Horbury. Photograph by Helen Bickerdike. In July 1899, two foundation stone ceremonies took place at the new United Free Methodist Church on the corner of Highfield Road and Bank Street. 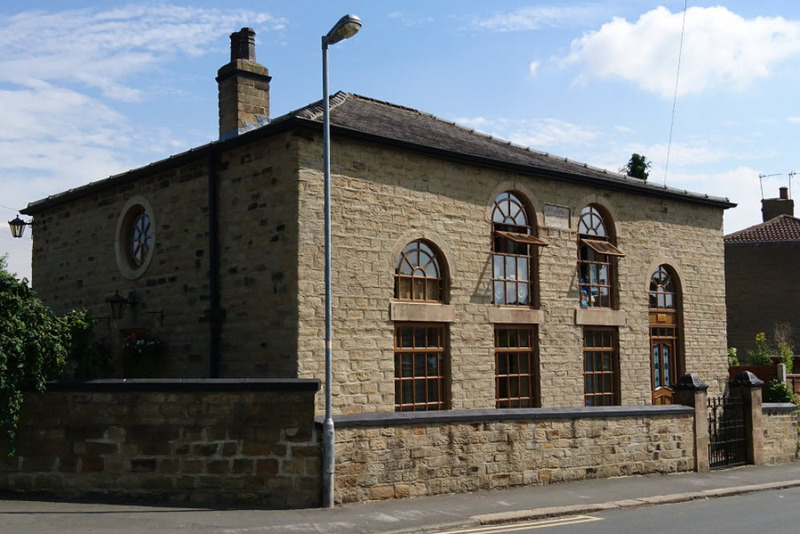 The construction was undertaken by Horbury builders Henry Fallas and Sons. The building is still there, now part of Nettleton's Furnishings. The new chapel opened in September 1900, it had two separate floors, the schoolroom being below the chapel. 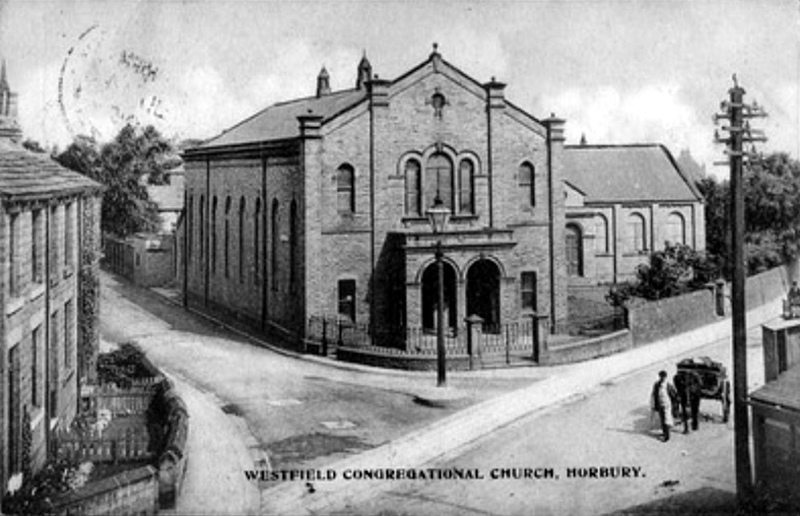 After supporting four different strands of Methodism, Horbury now only has one Methodist Church. Built on the site of St Paul's (Wesleyan) Chapel, it opened in 2016, the congregation having used the schoolroom and community centre for worship, whilst being without a chapel. The new church combines the old Primitive Methodist schoolroom and a brand new chapel. The result is a versatile space used by many local groups, with the future of the Methodist ethos very much in mind. 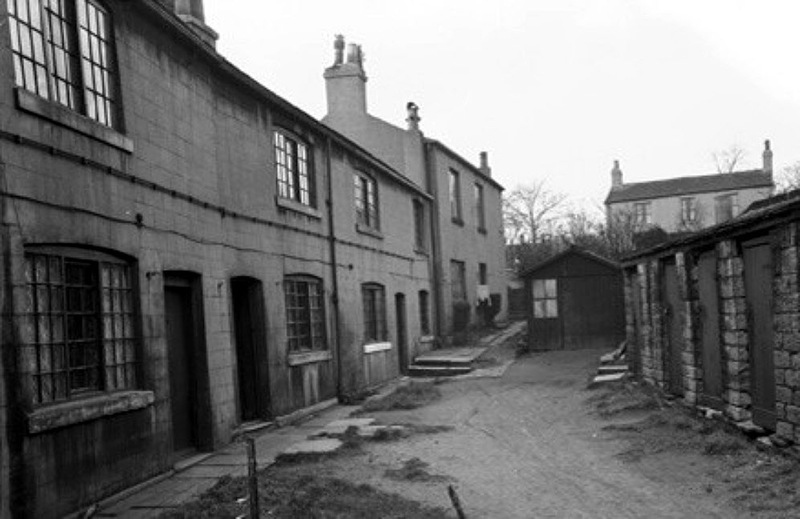 Above: Paradise Row, Horbury pictured in 1962, the location of the beginnings of the Horbury Methodist Free Church in 1853. Photograph from the W. Fowler collection. The the end of the High Street, at the junction with Tithe Barn Street, stands a currently derelict church, known as Westfield Congregational Church. This was built c.1878, when the former New Connexion Chapel at the top of Northgate became too small. With grateful thanks to Peter Day for allowing me to use his book as reference. 1. 'From Beginnings Unpromising' by Peter Renton Day, published 1984 by Horbury Methodist Church. 2. Photos as individually credited.